You have so many photos, videos, and songs stored on your memory card. So any problem with the card, and you risk losing all the files. One such issue is when you get an error message saying memory card not formatted when you try to access the card. This is a worrisome situation. But don’t fret; you are not alone. Many users face such issues with memory cards. You just need to know the right solution to the problem. Well, we are here for just that. 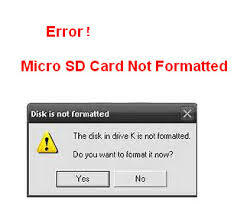 When you get the error message that memory card is not formatted, you need to first recover files present on the card. And then fix the format error. Note: Suppose you don’t have important data present on the card, and you are not worried about losing them, then you can directly skip stepping 2. In order to easily and quickly recover data from the memory card that won’t format, you can make use of Remo Recover software. This tool will safely get back all your files from the memory card which is showing not formatted error. So once you have recovered files from memory card, save them on a safe spot on your system or any other storage medium. This tool also helps to recover formatted memory card data with ease. So if you have accidentally formatted a partition or drive, you can make use of this software to restore erased data. Additional Info: Remo Recover software will restore data from various types of memory cards on Windows OS. It helps to retrieve SD card on Windows 10, microSD card on Windows 8, CF card data, and so on. Even the memory card is corrupted, inaccessible, turned RAW, the application comes to your rescue to recover files. This method fixes memory card not formatted error using CHKDSK command. Follow the steps to fix the error. How to recover data from formatted memory card in 5 clicks?